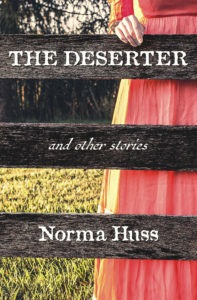 The Desert­er and Oth­er Sto­ries is a col­lec­tion that varies from flash fic­tion to nov­el­ette. Tak­ing place from 1813 to present day, the sto­ries range from tall tale to reimag­ined mem­o­ry to mys­tery to humor, with char­ac­ters from child to ghost. The ten sto­ries begin in a Chesa­peake Bay fish­ing vil­lage, then range in time and area until last July, end­ing with a mys­tery that returns to the bay. Crab appe­tiz­er recipes are includ­ed. Receive Norma’s Chat (usu­al­ly month­ly) and also receive this book free. Receive this book and enroll in Norma’s chat in one step: use this Book Fun­nel link and include your email address when asked for it. Norma’s Chat brings any pub­lish­ing news, free book offers, books on sale, a bit of chat (of course), per­haps a recipe, and, since she’s The Grand­ma Moses of Mys­tery, pos­si­bly a men­tion of grand­chil­dren. (Or not.) There will def­i­nite­ly be news of inter­est to read­ers, espe­cial­ly mys­tery read­ers.